Well, this is my FIRST go at 'proper' blogging. Here's a picture of me and my brother, Colin. We are on holiday in the south of France, that's why we look so happy! 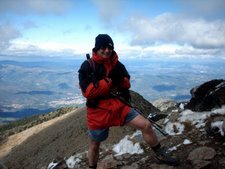 We have walked three times in the Pyrenees in the last four years. 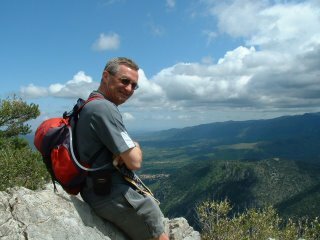 Here I am looking towards the Med' on a PERFECT day. Here we go - my first blog! This is me, the name's Les, and I am, (on this date - July 10th 2006) 52 years old. I LOVE walking/hiking/rambling - call it what you will, and get out almost every weekend. I have been doing this as a hobby since 1986, and it helps to keep me fit. I also love photography, which goes hand-in-hand with walking, and have a substantial library of pictures from everywhere I've been, expanded even more by my foray into digital a few years ago. I live near the Peak District in Derbyshire, and that's where most of my 'home' walking is done. Every year though, since 1991, I've done a long distance walk, usually lasting around ten days, and usually accompanied by my best friend and brother, Colin. The Scottish coast to coast walk (Southern Upland way - 212 miles). Dales way - 95 miles, started in Shipley. Wicklow way - 82 miles. Colin & I have also been to the Pyrenees four times in the last five years. It's a walkers paradise. 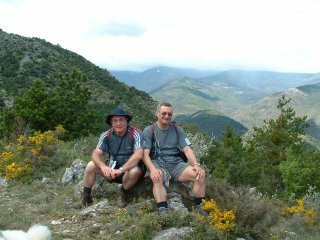 We did the Basque region for two years, walking about 180 miles of the GR10 LDP on the first visit, then, thanks to two very good friends, Brenda and Mannes, have explored a lot of south eastern France, Roussillon area. We are deeply grateful to Brenda and Mannes for making this dream come true. I hope to add to this blog on a regular basis, and will try to create some sort of album for the pictures, but for now, that's it! Well it was only time before Les started his Blog. I am surprised it took this long. Am looking forward to hearing more about the cruise to Norway and the next trip to France. Keep it UP, Les old fruit. Thanks 'Dad' - will do my best! Hi Les, Glad to hear you enjoyed your Norway cruise, was on Arcadia up the Fjords in June brill weather sounds like you had same, think weve communicated either on P&O CC or yahoo group WLC, found your blog via Invincible just registered but cannot get to forum for some reason.